Grace and peace be unto you in the name of our Lord and Savior Jesus Christ. This letter is being sent as per our Presiding Bishop and Chief Apostle, Bishop Charles E. Blake, Sr. 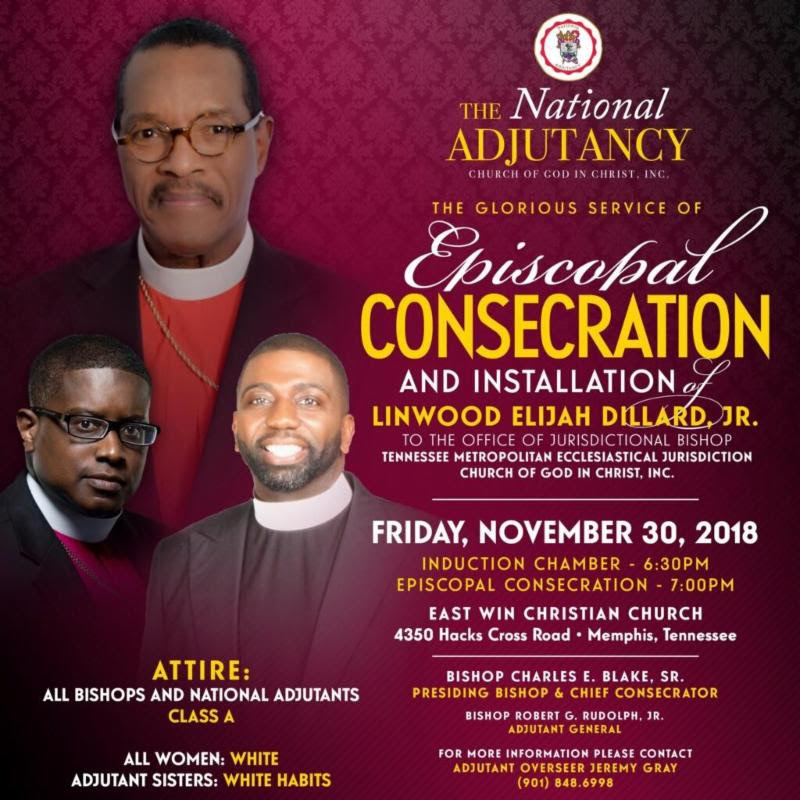 It is specifically given to all Bishops, members of the clergy and participants concerning the requested attire for the Service of Episcopal Consecration and Installation of Bishop Designate Linwood Elijah Dillard, Jr. to the Office of Jurisdictional Bishop of the Tennessee Metropolitan Ecclesiastical Jurisdiction. This service will convene Friday, November 30, 2018. The Induction Ceremony (which will be attended by Church Of God In Christ Bishops) will begin at 6:30 p.m. and the Service of Consecration (opened to all) will be at 7:00 p.m. Both the ceremony and the service will be held at East Win Christian Church, 4350 Hacks Cross Road, Memphis, TN 38125. As the Adjutant General, I am requesting that all Bishops and male clergy who will be attending the Consecration, please wear your “Class A” vestments. All National Adjutant brothers, who will be serving, please wear your “Class A” vestments. National Adjutant sisters who will be serving, please wear your white habits. If you are male clergy in attendance on that night, it is appropriate to wear the “Class B” attire. Generally, on this occasion we ask that all women wear white attire. If my office can be of further assistance to you, please feel free to contact me at (901) 947- 9345, Overseer Earl Matthews, Scribe of the National Adjutancy at (904) 217-9603 or Overseer Jeremy Gray at (901) 848-6998. May God’s blessings be upon the saints as we prepare for this Spirit-filled gathering. PreviousPrevious post:Episcopal Transition – Bishop Alva Chester NelsonNextNext post:Notice of Transition – Adjutant Brother Edgar L. Gray, Sr.